It Has WeighMeter™ Technology!If ya put too much weight, (more than the capacity of the scale) on any scale it can cause permanent damage. Unfortunately, most scales warn ya of an overload after it's too late. Luckily this Jennings scale comes with WeighMeter Technology to tell ya when you're coming close to the maximum capacity. This will save ya from overloading your scale and damaging it beyond repair. The Protective Cover Does Double Duty!This scale's unique hinged removable protective cover is great for keeping your scale safe when ya aren't using it...and it doubles as a nice expansion tray, increasing the area ya have to weigh your stuff on. Since it has edges, you can weigh all kinds of things that might normally roll right off the platform. It Remembers The Last Unit Ya UsedIf your application needs weights in the same unit of measurement, (like ounces for instance), it can be a real pain if your scale always turns on ready to weigh in grams. It's a good thing the JSR150 turns on displaying the unit of measurement you were using when ya turned it off. Stainless Steel PlatformThis digital pocket scale has a stainless steel weighing platform to make cleanup a breeze. The edge of the platform has a small lip clear around the perimeter of the scale, which helps keep items you're weighing from rolling off the platform. We have a bunch of customers who weigh beads and other small objects, and they just love this feature. Bright Backlit DisplayThis digital mini scale has a fancy red, backlit display to help ya see your weight readings, even in dim lighting. Easy CalibrationThis scale comes factory calibrated and ready to use. Just in case ya need to calibrate it, the JSR-150 comes with easy to follow calibration instructions. You'll just need to pick up a 100 gram calibration weight to get the job done. Man, This Thing Is Small!You won't have to worry about this little digi scale taking up space. It's just under five inches long, and less than an inch thick! You can take this scale pretty much anywhere ya want...stick it in a pack, purse, or in your shirt pocket. Auto-Off FeatureIf ya have ever had the batteries in something run out because you forgot to turn it off, you'll realize what a blessing this feature is. The JSR150 will automatically turn off after a few moments of inactivity, saving battery power and money. 20 YEAR MANUFACTURER'S WARRANTY!If ya have a problem with this scale, just send it to Jennings' warranty center in Phoenix, Arizona. They'll fix or replace your scale and send it on its way back to ya within a week of receiving it. You should expect your replacement to arrive in about two to three weeks from the day you send the original off. Keep in mind that sometimes Jennings runs out of stock, which can cause a delay in the warranty replacement process. The scale works perfectly/Thank you for it very much. It's great to find a product that is as good as the company advertises it to be. This little scale is as good as advertised. It worked perfectly, right out of the box. Weighs accurately and is simple to operate. I don't have a need to use it often, but as a metal detecting novice, the Jennings scale fills my need to evaluate some of my precious metal finds. It is a great addition to my metal detecting accessories. And, the folks at Old Will Knott's remind me of the service we used to expect from retailers decades ago. A great company and a great product. I could not be more satisfied. Great little scale, does everything that I wanted. Worked fine right out of the box. The website was also excellent is helping me select the right scale for my needs. Highly recommend both the scale and Old Will Knott! 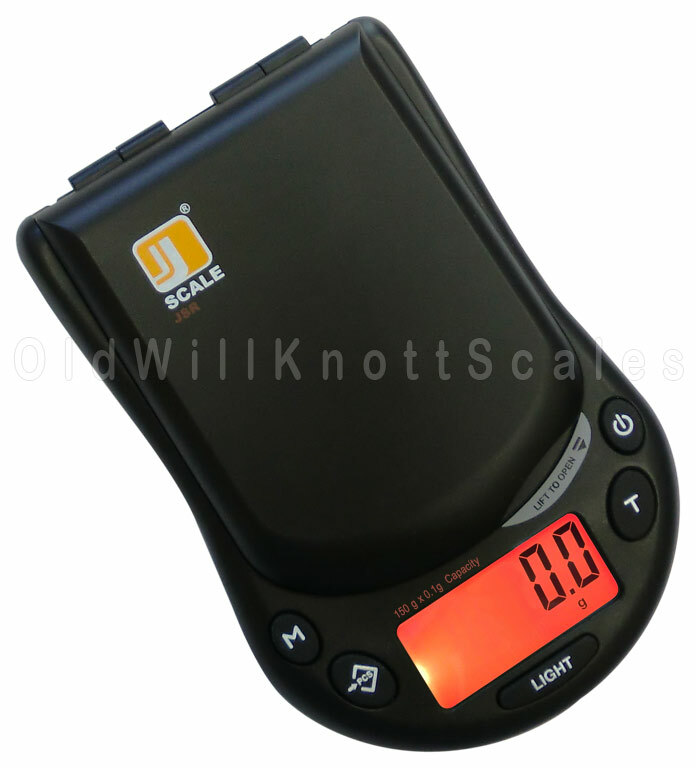 This scale uses standard AA batteries, unlike some other scales that use expensive round "coin" batteries. It's so handy to have around the house, we just purchased three more! The price point on this scale makes it a great deal. Compact, calibrated, ready for use, and accurate. I have recommended this scale to friends. 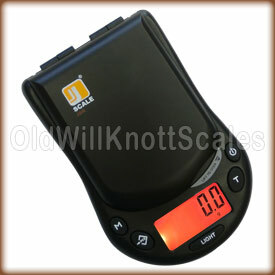 Good portable scale, with flat surface that makes it easy to measure items that could hang over the edge.